Image 1 of 48. Click to view fullscreen. Beautiful house with private pool and fabulous barbecue area only 800m. of canyelles beach. Located just 800m from "Cala Canyelles" beach, in a very quiet and residential area. Villa Londres has a capacity for 9 persons. Lower floor: large garage for 1 car with stairs that access the first floor of the house. If you access the house from the outside, you will find stairs to access the first floor with a beautiful garden around. First floor: large living room, nice and very cozy, large fully equipped kitchen with access to the pool terrace, toilet with direct access to the barbecue area and pool. Large suite room with bathroom with shower. Large terrace at the entrance of the house, where you can access the garden or the pool terrace. Upper floor: there are 2 double rooms and 1 triple room. Bathroom with bathtub. Large upper terrace with views of the pool and the mountain. In the outside area, Villa Londres has fantastic facilities: beautiful private pool with covered area with table, chairs and outdoor TV. Next to you will find the large covered barbecue area, wood oven, fully equipped outdoor kitchen with the beautiful garden that surrounds the entire house. Villa Londres is located in an exclusive area very close to the sea , only 800m from the Canyelles beach. Of the few family beaches and one of the most prestigious beaches of Lloret, the most prestigious restaurants of the town are located a few meters from the house. On the beach there is a marina with water activities for the whole family. The nearest supermarket is about 2 km away, with everything you need for your purchases. You can walk to the beach without car, and in this way, you will save the time and inconvenience of searching for parking. Villa Londres has a private garage for 1 car, but being in a dead-end street, with few neighbors, you can park the car near the house with tranquility, as it is a very quiet area. * In this house the groups of young people are allowed. * In this house pets are not allowed. Contact us for additional information. It will be a pleasure to help you with the booking of our fantastic holiday home! Villa Londres is located in an exclusive area due to proximity to the sea, only 800m of the beach. The most next beach is the Canyelles beach, much relative and one of the most prestigious beaches of Lloret, with restaurants, bars and sports port with several aquatic activities. You will be able to be walking to the beach without need to go with the car, and so you will not have the disadvantages of finding parquing. 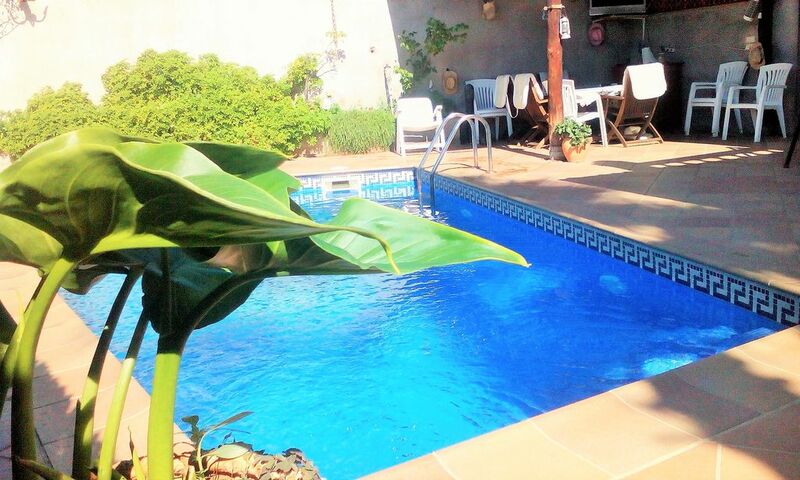 The house is to few meters of a club of tennis, and of the most prestigious restaurants of Lloret of Sea. Villa Londres is a big house with 3 double rooms and 1 triple room, a beautiful swimming pool deprived with an area covered to eat and to watch TV in the warm nights of summer next to the swimming pool. Nearby there meets the fantastic area of the barbecue, stove of firewood an exterior kitchen for serviceability. Wir mieteten die Villa Londres für 7 Tage. Die Villa verfügt über eine hervorragende Ausstattung. Es war alles vorhanden. Sämtliche Geräte der Küche standen zur Verfügung. Geschirr war im Übermaß vorhanden. Die Küche im Außenbereich mit dem Grill und dem Außenbackofen waren eine Bereicherung. Die vielen Terrassen-um das Haus, ermöglichte uns auch im Schatten zu sitzen. Der Pool traumhaft. Wir 8 Personen, alle in unterschiedlichen Alter-fanden das Haus super. Alles sauber und gepflegt. Mit dem Auto nach Lloret benötigten wir 10 Minuten. Zum Strand Fußweg 10 Minuten. Vorort sehr gute Restaurants vorhanden. Der Strand sehr idyllisch. Die Villa befand sich in einer ruhigen Gegend. Der Service zur Vermietungsgesellschaft(Frau Esther) kann ich nur als hervorragend bewerten. Meine Anliegen wurden sofort bearbeitet. Diese Herzlichkeit und Freundlichkeit erhält man selten. Wir haben uns alle sehr wohlgefühlt, so das uns die Woche zu kurz erschien. Die Betreuung durch Frau Esther ist in jeglicher Beziehung hervorragend. nette und kompetente Art. Es stimmte der Service in jeglicher Art. Wir werden Ihre Dienste nochmal in Anspruch nehmen. In juni zijn we 10 dagen naar villa Londres geweest. De sleutel overdracht ging prima en de borg is snel na thuiskomst terug gestort op de rekening. Mooi groot huis met voldoende ruimte. Alles wat je nodig hebt is aanwezig. Ruim voldoende glazen, borden, bestek en pannen. Goed werkende koelkast, wasmachine en afwasmachine. Buiten is er een heerlijk zwembad en een leuke buiten keuken. Een eetgedeelte onder een overkapping met zelfs een buiten televisie. Het is verstandig om wat extra handdoeken en lakens mee te nemen. We kregen met z'n tweeën voor 10 dagen twee kleine handdoeken, één onderlaken en één bovenlaken van een naar materiaal. Het huis ligt op een verhoging, je moet een aantal trappen op om bij de woning te komen. Er ligt vlakbij een wat drukkere weg die je overdag wel hoort, maar je 's nachts geen last van hebt. Met de auto is het 10 minuten rijden naar Lloret de Mar en 20 minuten naar Tossa de Mar. Perfect place to only 800m of the Beach Canyelles, club of tennis, sports port, aquatic activities and prestigious restaurants of Lloret de Mar. You have the restaurant Sybius to 800m of the house with beautiful views to the beach. The next supermarket is to approximately 2 km, with everything necessary for your buys.